Discussion in 'iMac' started by Ahheck01, May 25, 2011. Just got the 27" iMac, and I feel like I'm going to wear out this relatively cheap desk surface very quickly with this magic mouse. I'd like a quality mousepad that's very thin but with no design on it - I try to keep somewhat of a minimalist workspace. Any suggestions? What do you use? Pics? It look(ed) really cool. I don't know if they still sell it but maybe you can try and hunt it down if you like it. I too like Razer mouse pads. I have a rather large one aptly named "goliathus" purchased off of amazon. I got a jumbo black mousepad from amazon for about $7. I have a glass desk, it basically becomes half of the side, it's wonderful to never run out of mousepad space. I have the Razer Megasoma paired with my Naga Epic and it's a sweet combo. The pad is even big enough so that I can have my Magic Trackpad next to the mouse without it being in the way. 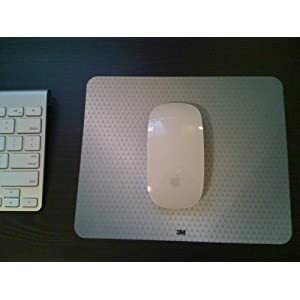 I have a aluminum mousepad from Compact Desk and love it. I tried to pursharse one some months ago and they just don't send me it or reply to any of my emails. Some weeks later the purchase I needed to contact paypal to get my money back. Alupad is really nice also. Wow, almost $70.00 shipped to the US! Not for me. I use this,it covers most of the table. I like the Alugraphics. Match great with Macs. Minimalist and mousepad dont go together in the same sentence lol. A true minimalist wouldn't have a mouse pad! I have that coming in today . 3M says: "The bottom of the pad features 3M repositionable adhesive, allowing it to be securely fastened to and removed from flat surfaces again and again." Does the adhesive cover the entire bottom of the mouse pad? Is the adhesive something that is going to get messed up with dust and lint, etc.? Do you think it will loose it's adhesive ability over time? Go for the Apple Trackpad if you want a true minimalist look. They work great and when your'e done with it, you can literally sit it flush next to the keyboard to look like one unit. I was thinking of getting a White glass desk from Ikea sometime....so it's not a pure transparent glass (like another one I have at home). I wonder if the Magic mouse will work fine on it? I'm thinking about getting this one in white. I've searched the internet high and low and ordered dozens of mousepads. All my research leads me to believe this is the absolute best in value and quality. http://www.amazon.com/gp/product/B001762CBQ/ref=pd_lpo_k2_dp_sr_1?pf_rd_p=486539851&pf_rd_s=lpo-top-stripe-1&pf_rd_t=201&pf_rd_i=B000Q8SEDQ&pf_rd_m=ATVPDKIKX0DER&pf_rd_r=1946YZE73R364H58F724 Allsop Travel Widescreen mousepad. It is barley 1/8" thick, Widescreen to match your monitor and is made out of the best cloth material I've ever seen. Get this mousepad, you will not be dissapointed. I use my razer pad with a razer diamondback mouse, but it dont think it matters. My pad is at least 5 years old, and looks brand new. AL surface is bog and easy to clean and its rock solid. I used to use the thin plastic ones (sorta like the 3M one) but none of them even came close to my exactmat. great purchase, I would do it again in ssecond. I also find the cloth mouse pads are much more quiet than their plastic counterparts. A really thin cloth mouse pad, a glass desk and a Magic Mouse are a hard combo to beat.